We accept overseas shipping NO LONGER. Shipping cost rose year after year. Since it was $15.00 a couple years ago, it is $22.00 now. Even you spent $22.00 for shipping fee, we can't trace your package. Possibly it will be $24.00 or more in 2019. We decided that we stop sending to overseas. Commission artwork is available now ! Shin's cutaway artwork is very skilled-craft work. He uses several fine ceramic pens properly. 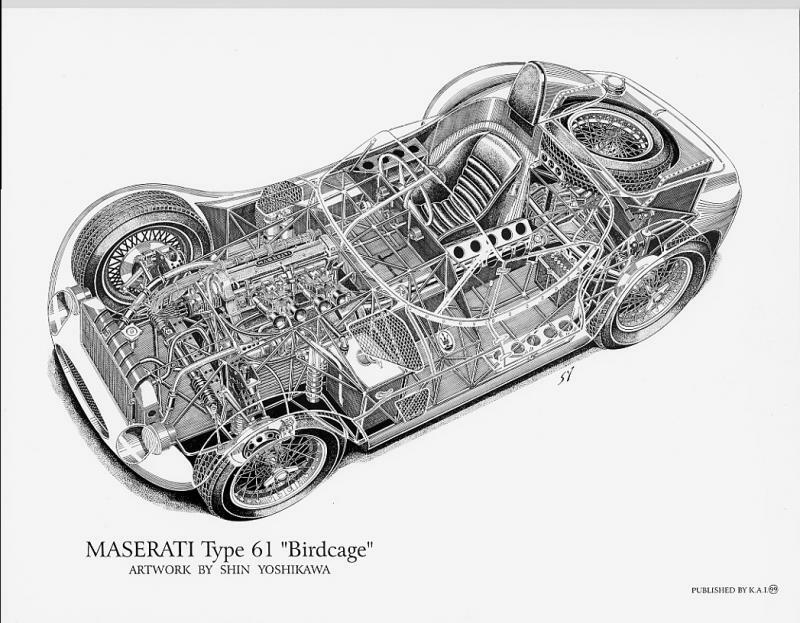 The cutaway artwork is described with his distinguished experience and expert knowledge on automobile structure. 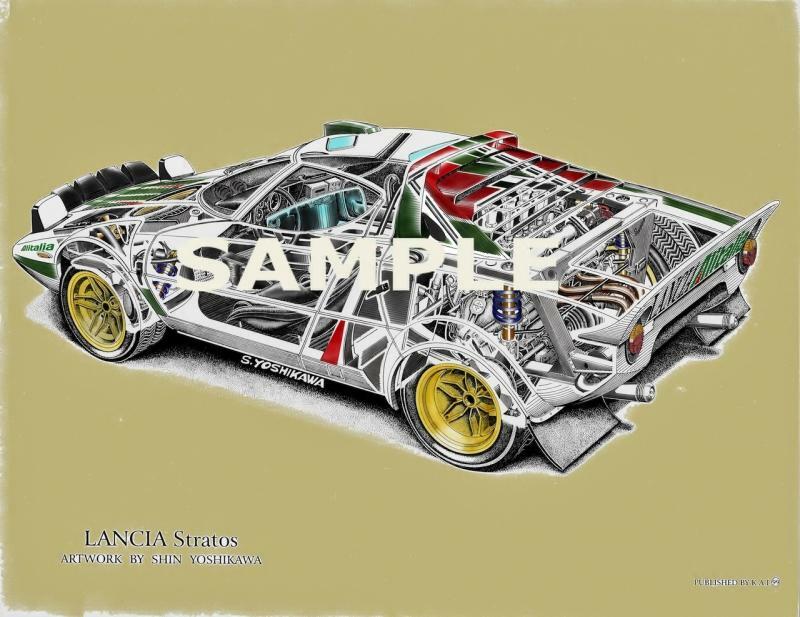 We recommend his artwork for car manufacture, museum, publisher and high-end collector. He accepts one to two commision work in a year. Board size : 18" x 24"
We selected a little smarter idea of gifts for your important person. Everything is rare item that Shin has collected for 50 years. 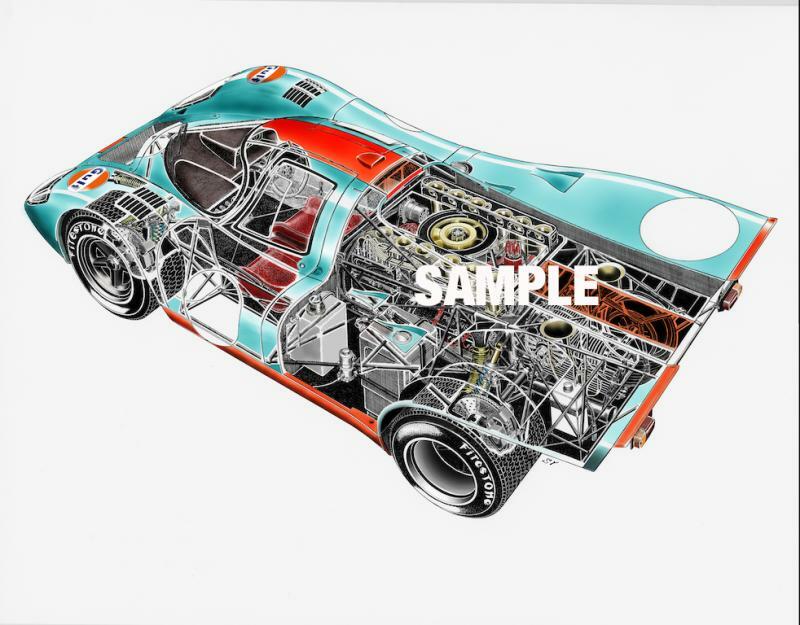 For example, original sales brochures and collectable scale models, press release and manuals. 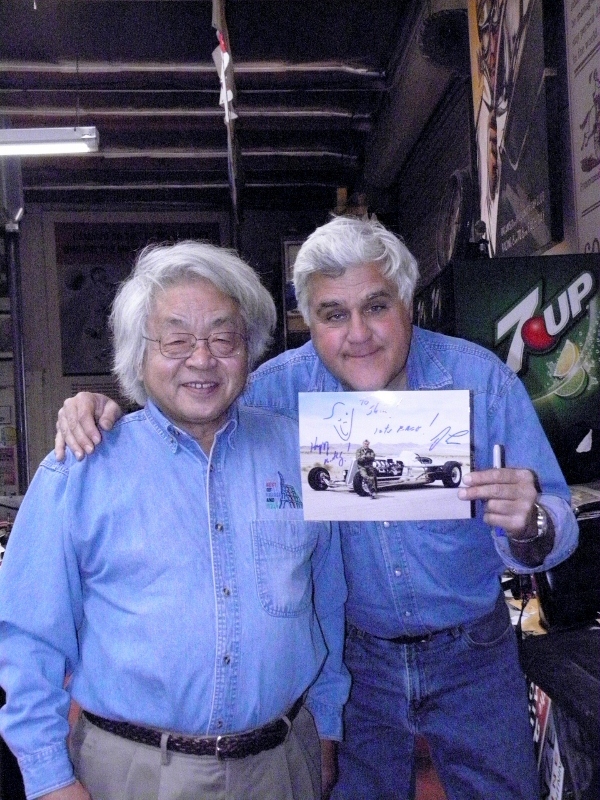 some scale models have famous driver's autograph. 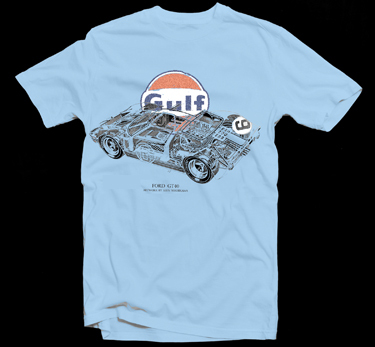 Chic Italian collection from 50's ABARTH BOUTIQUE. And, there is a car from Shin's collection on the list. If you are looking for genuine gifts, please stop by Shin's Automogilian Boutique. We are pleased to announce coming artworks. 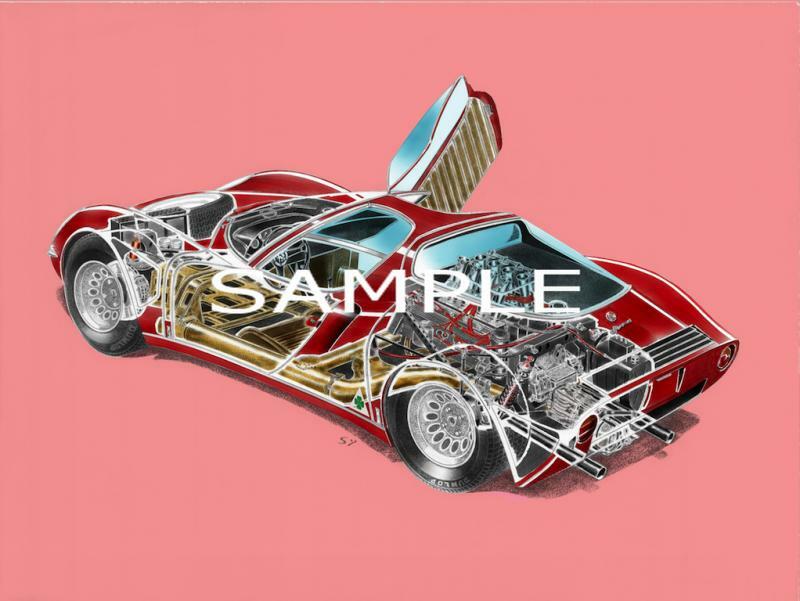 # 2 Alfa romeo Tipo33 "STRADALE"
pen and black ink for his cutaway artwork. He makes several layers description of car structure on illustration board. 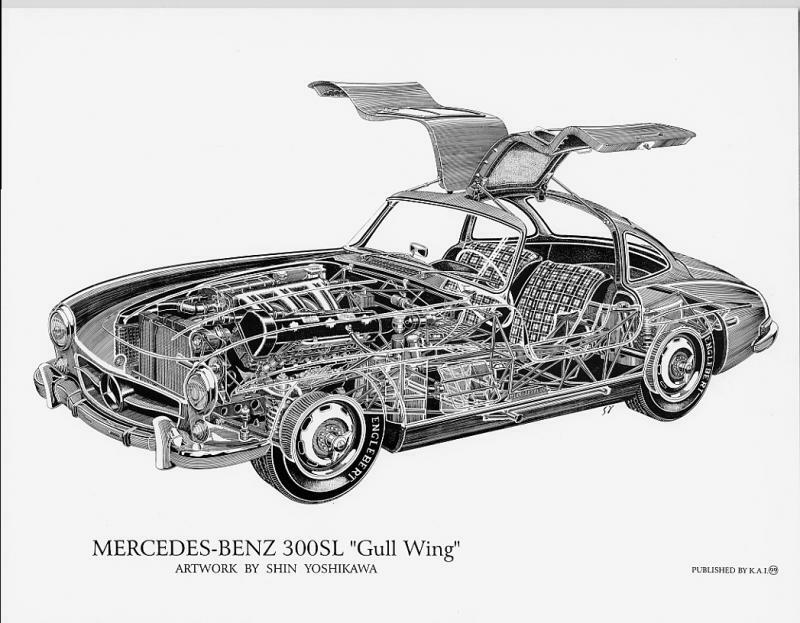 His eyes pick on the best angle of a car, and his brain sifts out unnecessary parts for his cutaway's describing. Each black line fills the role of car's structure. 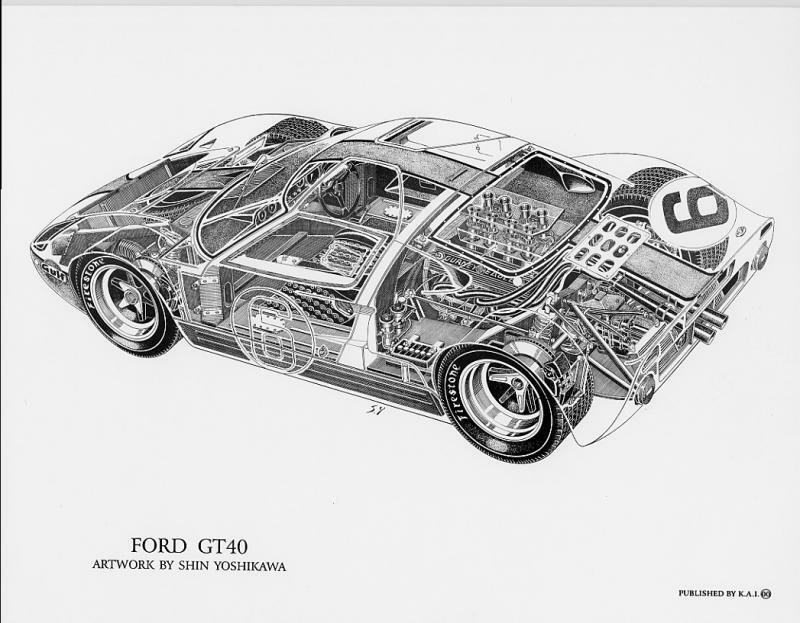 Finished drawing is not an anatomy diagram, but it is a sophisticated automotive art. We tried to combine Shin's cutaway artwork and UKIYOE for giving a third dimension. UKIYOE, one of arts of the 18th century in Japan, is very popular art as masterpiece of Japan's classic culture. They were described with sentient coloring. Made repeated trial and error for giving color under retaining an original line. Finally, we succeeded in combinig cutaway artwork and UKIYOE- touch coloring with up-to-date technology. There is no doubt that the artworks have an impact on your five senses. 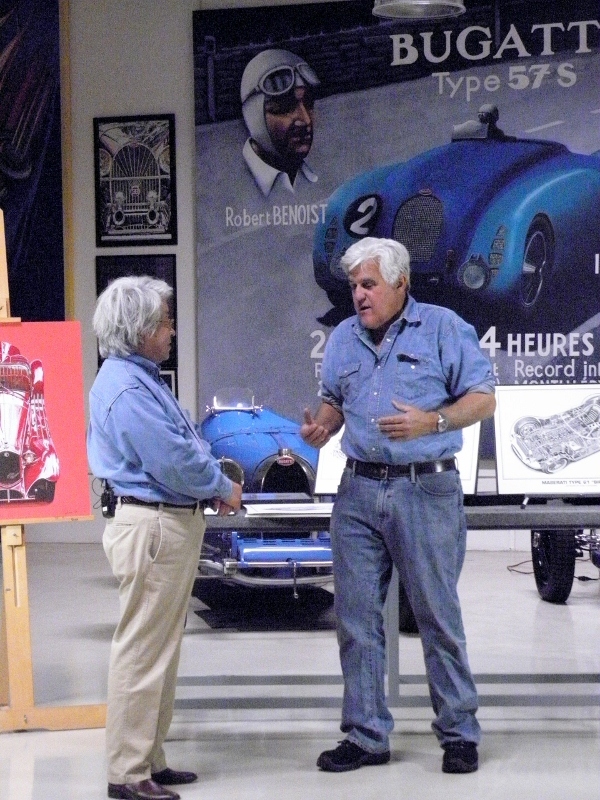 I met Jay Leno at the book store when I visited there for see my friend, Peter Brock. Jey Leno is my hero, of course your hero too. I boldly introduced myself and shook hand with him. A few weeks later, Jay called me and asked about my artworks. He said " I'll introduce you and your artworks in my web". I was excited. However, I have a big problem and a complex, as you know. I asked Jay " Is Shinglish OK ?". He said " No problem". 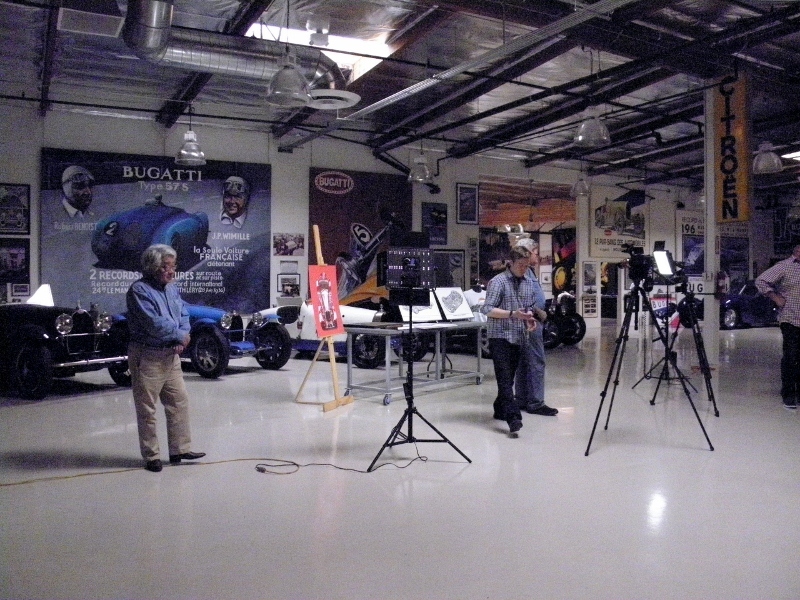 I went to Jay Leno Garage for the meeting of filming. It was not meeting but eating Pizza. The D-day, I arrived three hours early and I was roaming in the Garage. I was so nervous. The filming went off well, but I don't remember it. I admire his great career in Talk Show. And, I really appreciate your cheering. We always appreciate your business. Everything had rose year after year. We never changed our poster price past fifteen years. And, shipping cost is also changed. and we hope to see more of you. Kai Art International was established 1994,and we have been publishing lithograph and books which are created by Shin Yoshikawa. 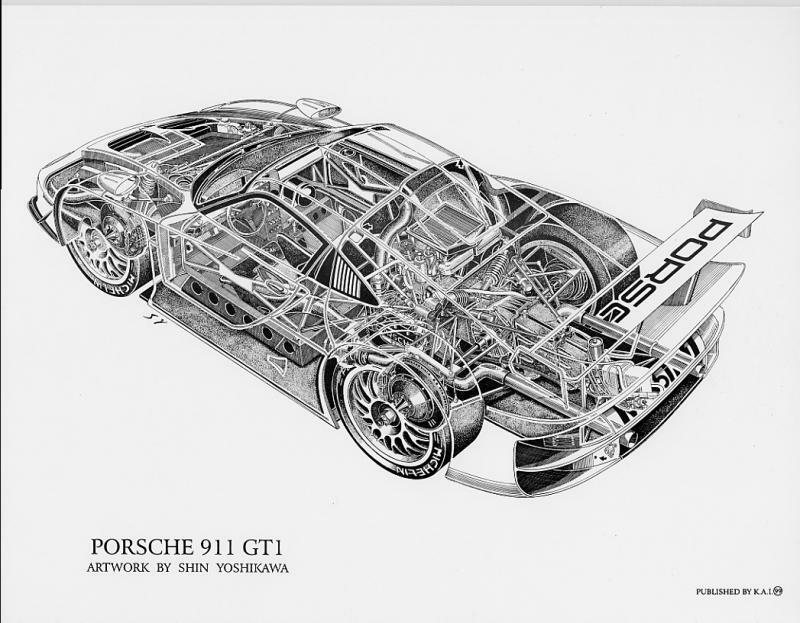 Shin Yoshikawa is a renown cutaway drawing artist and automobile journalist. 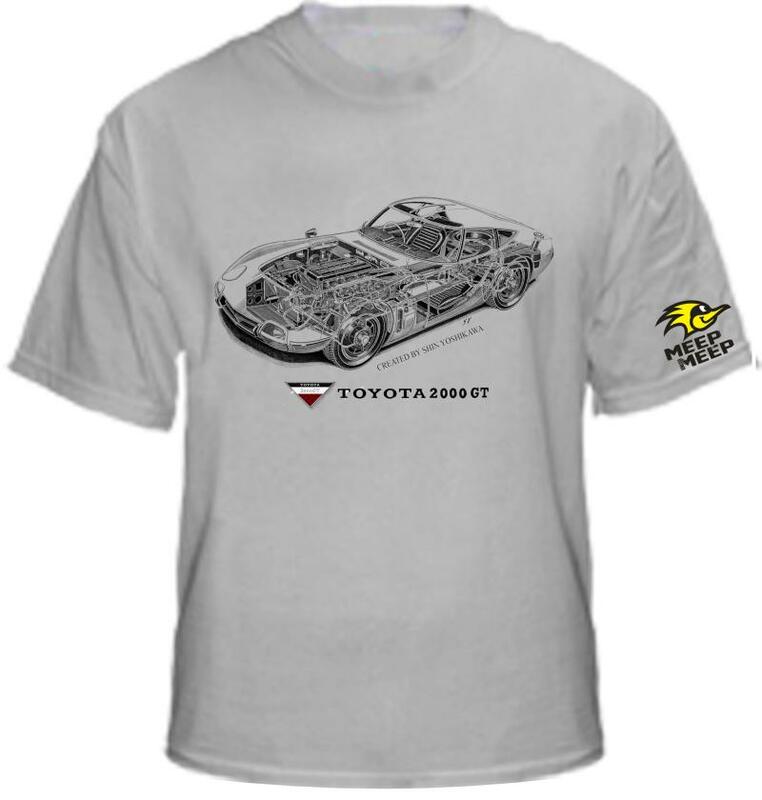 Especially,his name is well-known all over the world as an author after his book" TOYOTA 2000GT" was released. We are proud of introducing Shin's accomplished works to you.